With increasing numbers of Australians setting up small businesses from their home or choosing to telework, the designer of a new stand alone office space that fits in your garden, says it’s important for home workers to have a separate space for business, which is comfortable to work in and aids productivity. 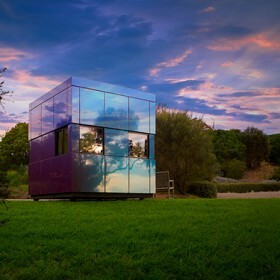 “Free up your spare room and focus your mind on work.” Said Jason Fremder, co-creator of Harwyn, a unique stand-alone office ‘pod’ launching at the 2014 Melbourne International Flower and Garden Show. According to Australian Bureau of Statistics (2013), the vast majority (96%) of Australian businesses in June 2012 were small businesses. Of these, 39.5% of micro or small businesses ‘had the ability for staff to work from home’. The ABS estimates that in 2011, one in every 12 workers (764,700) did more hours at home than any other single location in their main or second job. “These figures show there is now a need, more than ever before, to make sure the home office is a place of productive business, one that is separate from your living space to help better juggle personal and professional, and achieve a good life balance.” Said Fremder. Harwyn is exactly that, and is set to change the face of home working in Australia. A self-contained, purpose built studio space kitted out with essential connective technology and fixtures, all that’s needed for the Harwyn team to erect the prefab pod is a space of two and a half metres by two and a half metres. It was designed to fit in a backyard garden, plugs into existing mains as an appliance would, and it can be installed on site by the Harwyn team in just a few hours. “Home workers need a comfortable, secure and professional working environment without the usual distractions associated with working from home, we have created that space with Harwyn which really does provide that all important boundary between work and home.” In a collaboration with prominent Melbourne Architect Selwyn Blackstone, Harwyn meets the demands of the modern small business owner, and has been designed with the latest ‘sustainability thinking’ in mind. 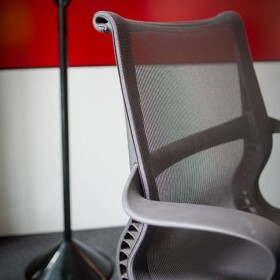 “Professionals now expect more in terms of how their work environment makes them feel. Studies show that a well-designed office space can improve happiness and wellbeing, can reduce absenteeism and even increase productivity and creativity…Harwyn is a place where people will be comfortable, it’s a nice place to be, and it’s purpose built for the user to conduct business.” Designed to exceed the energy efficiency rating of most domestic and commercial developments, the beautifully designed ‘pod’ breaks the mould with its architecture, finishing and the vibrant colour palette. Each pod requires minimal ongoing maintenance and is durable enough to last the most severe weather conditions. 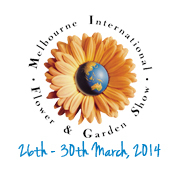 On display at the Melbourne International Flower and Garden Show 26-30 March 2014, and permanently on display at the Harwyn showroom at 4 Paterson Street Abbotsford. Harwyn pods can be used as home offices, recreation spaces such as art studio, music room, play room for the kids, yoga studio or just a quiet, distraction-free place to study. 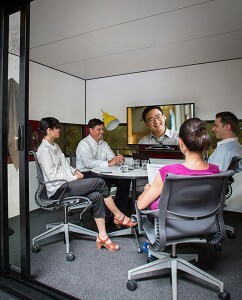 Cutting edge design, wired for connectivity with video and audio conferencing facilities. Fully outfitted with electrical equipment and furniture, including custom desk and cabinets with adjustable shelves, and boast a shimmering European ACM exterior finish. Inspired by the mechanical strength and high protection levels found in European luxury car design. Constructed with dual barriers against the Australian sun, the pods have an external skin that acts as an initial barrier against solar radiation, while a series of fully insulated structural panels provide a second layer. Three packages in the range – the Prestige, Professional and Luxury – come with custom features such as LED strip lighting, Sony TV, Apple TV, Tretford Carpet, remote control blinds, state-of-the art Sonos sound system, European ACM and European ducted climate control systems. UK: the number of people working from home is on the increase in the UK, according to the CBI. A total of 59% of employers who responded to a survey in 2011 were offering teleworking, up from 13% in 2006. US: In the US, 24% of employed people report working from home at least some hours each week, according to the Bureau of Labour Statistics. AUS: On Census night in 2011, 434,000 Australians worked from home that day. The Australian Bureau of Statistics estimates one in every 12 workers (764,700) did more hours at home than any other single location in their main or second job. Jason Fremder: Jason is a free spirited entrepreneur.. he has worked and lived in Japan, Tel Aviv, Indonesia and has now settled back in Melbourne with his young family and two lovely daughters. He has unleashed his passion in design and found the perfect working partnership with his Architect father in law, Selwyn Blackstone. Selwyn Blackstone: is a prominent Architect with over 45 years experience in architecture and design.